14K White Gold Wedding Band. 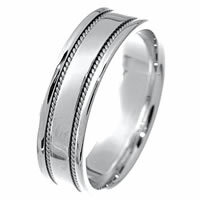 - 14 K white gold, 9.50mm wide, 4mm thick, handmade, comfort fit wedding band. The finish on the hand made cable ropes are matte and the rest of the ring is polished. Different finishes may be selected or specified. 14K, Hand Crafted Wedding Ring - 14K two-tone, hand crafted, 7.0 mm wide, comfort fit, black antiqued wedding band. Leaves are hand carved. The finish is polished. Different finishes may be selected or specified. 14K White gold Hammered Wedding Band - 14K white gold, 6.0mm wide, comfort fit, center part hammered wedding band. 14K Hammered White Gold Wedding Band - 14K white gold, comfort fit, 8.0mm wide, center hammered, hand made wedding band. 14Kt Two-Tone Hand Made Brick Wedding Band - 14Kt Two-tone hand made brick wedding band. The ring is about 7.0 mm wide and comfort fit. The ring is polished. Different finishes may be selected or specified. 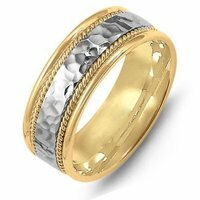 14K Handcrafted Wedding Band - 14K Two tone, comfort fit, 7.0 mm wide, hand crafted wedding band. There are two hand made ropes inlayed in the band. The finish on the ring is polished. Different finishes may be selected or specified. 14Kt White Gold Hand Made Brick Wedding Band - 14Kt White gold hand made brick wedding band. The ring is about 7.0 mm wide and comfort fit. The ring is polished. Different finishes may be selected or specified. 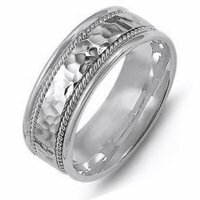 14 K White Gold Handcrafted Wedding Ring - 14kt White gold handcrafted, carved, comfort fit, 8.0mm wide wedding band. The center of the ring is carved and one hand crafted rope on each side of the carving. It is 8.0mm wide and comfort fit. 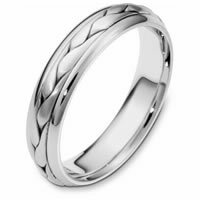 14 kt Hand Made Wedding Band - 14 kt white gold, hand made comfort fit Wedding Band 6.0 mm wide. The ring has a handmade braid in the center with a brush finish. The edges are polished. Different finishes may be selected or specified. 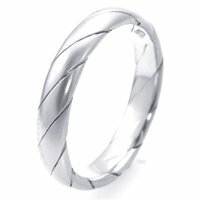 14K White Gold Twisted Wire Wedding Band - 14K white gold, 5.0mm wide, comfort fit, hand made wedding band. 14K Handcrafted Wedding Ring - 14 kt white gold, hand made, comfort fit Wedding Band 7.0 mm wide. 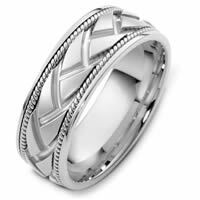 There is a beautifully hand crafted white gold braid inlayed in the center. The finish is matte. Different finishes may be selected or specified. 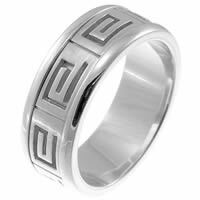 14Kt White Greek Spartan Key Wedding Band - 14Kt White gold greek spartan key wedding band. A hand crafted ring made with Greek motifs. The ring is about 8.0 mm wide and comfort fit. The whole ring is polished. Different finishes may be selected or specified. 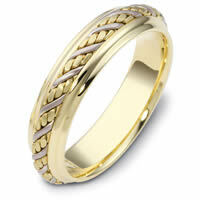 Hand Braided 14 Kt Two-Tone Wedding Band - Hand crafted, 14 kt two-tone gold, 9.0 mm wide, comfort fit wedding band. 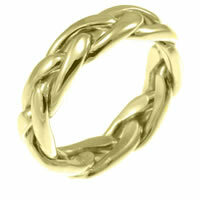 The ring is beautifully braided in the center with 14 kt white and yellow gold. The finish is polished. Different finishes may be selected or specified. 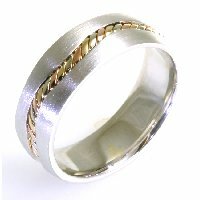 14K Two-Tone Hammered Wedding Band - 14K two-tone gold, comfort fit, 8.0mm wide, center hammered, hand made wedding band. 14 kt Hand Made Wedding Band - 14 kt hand made comfort fit Wedding Band 6.0 mm wide. 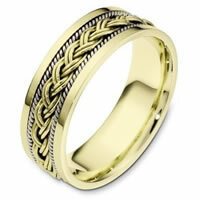 The ring has two beautiful hand crafted braids in the center with a polished finish. The rest of the band is polished. Different finishes may be selected or specified. 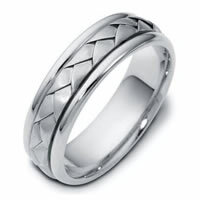 14K Handcrafted Wedding Band - 14K white gold braided, 8.0 mm wide, comfort fit wedding band. The finish is polished. Different finishes may be selected or specified. 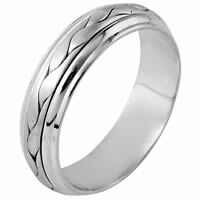 14 K White Gold Handcrafted Wedding Ring - 14kt White gold handcrafted, comfort fit, 7.5mm wide wedding band. 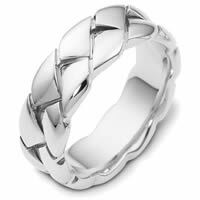 The ring has a beautiful handcrafted braid in the center that has a matte finish. The edges are polished. Different finishes may be selected or specified. 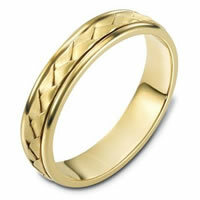 14 kt Hand Made Wedding Band - 14 kt hand made comfort fit Wedding Band 5.0 mm wide. The ring has a handmade braid in the center with a brush finish. The edges are polished. Different finishes may be selected or specified. 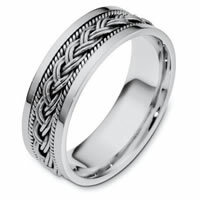 14K Celtic, Knotted Wedding Band - 14Kt white gold hand made open braided, approximately 6.0 mm wide, Celtic wedding ring. The ring is polished. Different finishes may be selected or specified. This item can not be engraved. 14K Hand Made Wedding Band - 14 kt white gold, hand made, comfort fit Wedding Band 5.0 mm wide. The ring has a handmade braid in the center with a brush finish. The edges are polished. Different finishes may be selected or specified. 14K Hand Made Wedding Band - 14 kt hand made, comfort fit, Wedding Band 6.5 mm wide. The center of the ring has a hand made braid which has a brushed finish. The outer edges are polished. Different finishes may be selected or specified. 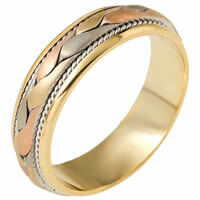 Wedding Band Passion - Hand crafted, 14 kt two-tone gold 6.0 mm wide, comfort fit band. 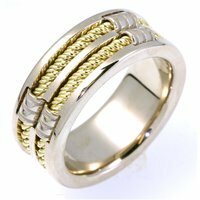 Two channels of 14 kt yellow gold twisted ropes completes the ring. The whole ring is polished. Different finishes may be selected or specified. 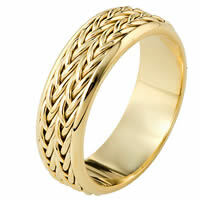 14K Celtic Knotted Wedding Ring - 14Kt yellow gold hand made open braided, approximately 6.0 mm wide, Celtic wedding ring. The ring is polished. Different finishes may be selected or specified. This item can not be engraved. Wedding Band 14K Two-Tone Hand Made 7.0mm - 14kt two-tone hand made comfort fit Wedding Band 7.0 mm wide. There is a hand made braid in the center of the band and one hand crafted rope on each side of the braid. The whole ring has a polished finish. Different finishes may be selected or specified. 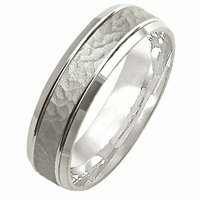 Wedding Band Passion - Hand crafted, 14 kt white gold 6.0 mm wide, comfort fit band. Two channels of 14 kt white gold twisted ropes completes the ring. The whole ring is polished. Different finishes may be selected or specified. 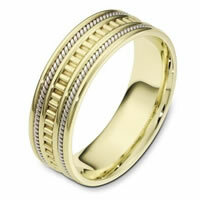 14K Handcrafted Wedding Band - 14K two-tone, comfort fit, hand made, 8.0 mm wide wedding band. The finish is polished. Different finishes may be selected or specified. 14 kt Hand Made Wedding Band - 14 kt Hand made comfort fit Wedding Band 5.5 mm wide. The ring has a handmade braid in the center with a brush finish. The edges are polished. Different finishes may be selected or specified. 14 kt Hand Made Wedding Ring - 14 kt tri-color hand made comfort fit Wedding Band 7.0 mm wide. The center of the band has a handcrafted braid with a handmade rope on each side of the braid. The center of the ring has a brush finish and the edges are polished. Different finishes may be selected or specified. 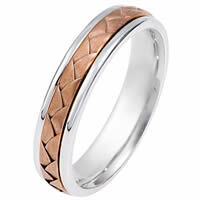 14K Rose & White Gold Handcrafted Wedding Ring - 14kt Rose and white gold handcrafted, comfort fit, 7.5mm wide wedding band. 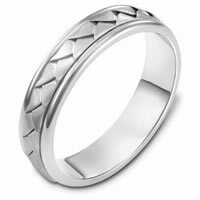 The ring has a beautiful handcrafted braid in the center that has a matte finish. The edges are polished. Different finishes may be selected or specified. 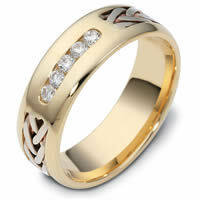 14 kt Handcrafted Wedding Ring - 14 kt tri-color hand made comfort fit Wedding Band 7.0 mm wide. 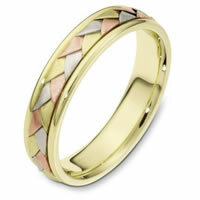 There is a beautifully hand crafted yellow, rose, and white gold braiding inlayed in the center. The finish is matte. Different finishes may be selected or specified. 14 kt Hand Made Wedding Ring - 14 kt white gold, hand made Wedding band 5.5 mm wide. 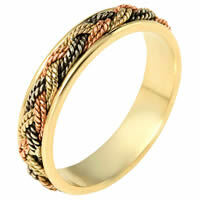 The ring has a beautiful hand crafted braid in the center with a brush finish. The edges are polished. Different finishes may be selected or specified. 14kt Hand Made Wedding Ring - 14 kt hand made comfort fit Wedding Band 7.0 mm wide. The center of the band has a handcrafted braid with a handmade rope on each side of the braid. The center of the ring has a brush finish and the edges are polished. Different finishes may be selected or specified. 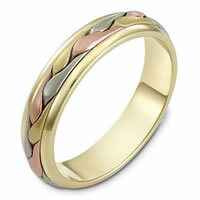 14 kt Hand Made Wedding Ring - 14 kt tri-color hand made comfort fit Wedding Band 6.5 mm wide. The ring has a hand crafted braid in the center with one hand made rope on each side of the braid. The center is brush finish and the rest is polished. Different finishes may be selected or specified. 14 kt Hand Made Wedding Ring. 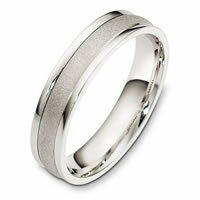 - 14 kt hand made comfort fit Wedding Band 5.5 mm wide. The ring has a handmade braid in the center with a brush finish. The edges are polished. Different finishes may be selected or specified. 14 kt Hand Made Wedding Band - 14 K Hand Made comfort fit Wedding Band 5.0 mm wide. The ring has a handmade braid in the center with a brush finish. The edges are polished. Different finishes may be selected or specified. 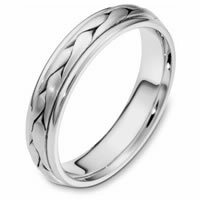 14 kt Hand Made 7.0mm Wedding Band - 14 kt white gold, hand made comfort fit Wedding Band 7.0 mm wide. There is a hand made braid in the center of the band and one hand crafted rope on each side of the braid. The whole ring has a polished finish. Different finishes may be selected or specified. 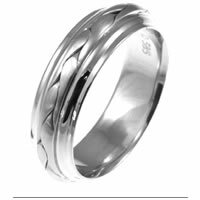 14K White Gold Wedding Band - 14K white gold, comfort fit, 5.0 mm wide wedding band. The band center is coarse matte finished the sides are high polished. Other finishes may be selected or specified. 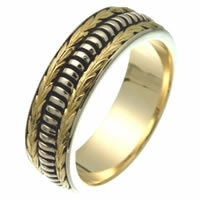 14 kt Hand Made Wedding Band - 14 kt tri-color hand made comfort fit Wedding Band 5.0 mm wide. The ring has a handmade braid in the center with a brush finish. The edges are polished. Different finishes may be selected or specified. 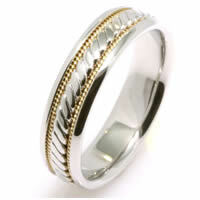 14 kt Hand Made Wedding Ring - 14 kt two-tone hand made Wedding band 5.5 mm wide. The ring has a beautiful hand crafted braid in the center with a brush finish. The edges are polished. Different finishes may be selected or specified. 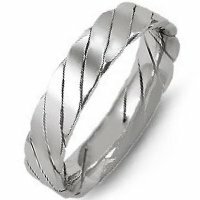 14K White Gold Twisted Wire Wedding Band - 14K white gold, hand made, comfort fit, 4.0mm wide wedding band. 14 kt White Gold Hand Made Wedding Band - 14 kt white gold, hand made comfort fit Wedding Band 7.0 mm wide. The braid in the center is handcrafted and is a brush finish. The outer edges are polished. Different finishes may be selected or specified. 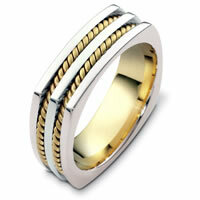 Wedding Ring 14 kt Hand Made - 14 kt two-tone hand made comfort fit Wedding Band 7.0 mm wide. There is a hand made braid in the center with one rope on each side of the braid. 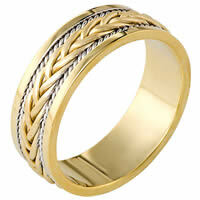 The center braid has a brush finish and the rest of the ring has a polished finish. Different finishes may be selected or specified. 14K Hand Made Wedding Band - 14 kt hand made comfort fit Wedding Band 6.0 mm wide. The ring has a handmade braid in the center with a brush finish. The edges are polished. Different finishes may be selected or specified. 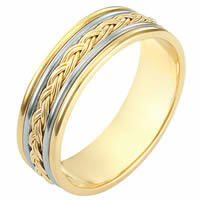 Braided Wedding Band 14kt Gold - 14 kt white gold, hand made comfort fit Wedding Band 5.0 mm wide. The ring has a handmade braid in the center with a brush finish. The edges are polished. Different finishes may be selected or specified. 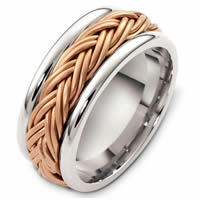 Wedding Band Braided 14K Rose and White Gold - 14kt hand made comfort fit Wedding Band 5.0 mm wide. The ring has a hand made braid in the center that is a brush finish. The outer edegs are polished. Different finishes may be selected or specified. 14K Gold Wedding Band. 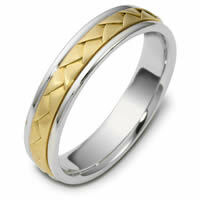 - 14 K two-tone gold, 9.50mm wide, 4mm thick, handmade, comfort fit wedding band. The finish on the hand made cable ropes are matte and the rest of the ring is polished. Different finishes may be selected or specified. 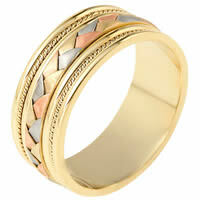 14 K Wedding Ring 14 kt Hand Made - 14 kt hand made tri-color comfort fit Wedding Band 5.0 mm wide. The ring has a handmade braid in the center with a brush finish. The edges are polished. Different finishes may be selected or specified. 14 kt Hand Made Wedding Band - 14 kt white gold, hand made comfort fit Wedding Band 7.0 mm wide. The braid in the center is handcrafted and is a matte finish. The outer edges are polished. Different finishes may be selected or specified. 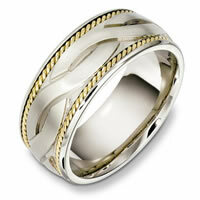 Hand Crafted Wedding Band - 14 K two tone , white and yellow gold, 6.0 mm wide comfort fit, hand crafted wedding band. The brushed center is a hand made design with one hand crafted rope on each side of the design with the rest of the band polished. Different finishes may be selected or specified. 14 kt Hand Made Wedding Ring - 14 kt hand made comfort fit Wedding Band 6.0 mm wide. The ring has a handmade braid in the center with a brush finish. The edges are polished. Different finishes may be selected or specified. 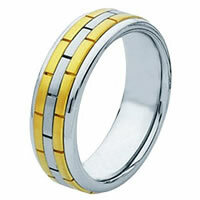 14 Kt Two-Tone Wedding Band - 14 Kt Two-tone weddding band, 9.0 mm wide, comfort fit wedding band. The ropes are 14kt yellow gold. The center is matte and the rest of the ring is polished. Different finishes may be selected or specified. 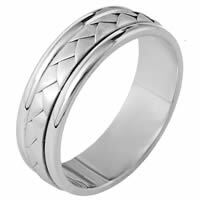 14 kt Hand Made Wedding Band - 14 kt white gold, hand made comfort fit Wedding Band 7.0 mm wide. There is a hand made braid in the center with one rope on each side of the braid. 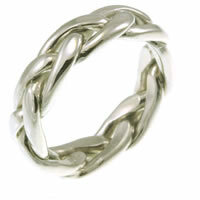 The center braid has a brush finish and the rest of the ring has a polished finish. Different finishes may be selected or specified. 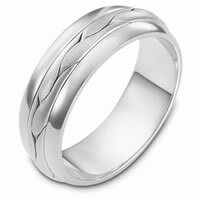 14 kt Hand Made Wedding Band - 14 kt white gold, hand made comfort fit Wedding Band 5.0 mm wide. The ring has a handmade braid in the center with a brush finish. The edges are polished. Different finishes may be selected or specified. 14K Hand Made Gold Diamond Wedding Ring - 14 K yellow or white gold 7.0 mm. wide, diamond ring. Diamonds total weight is 0.22 ct . Diamonds are VS1-2 in clarity G-H in color. There is a hand crafted braid on each side of the diamonds. The braid and center portion around the diamonds have a brush finish. The rest of the band is polished. Different finishes may be selected or specified. 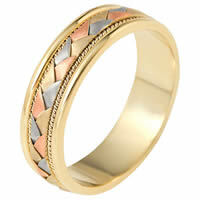 14 kt Hand Made Wedding Band - 14 kt tri-color hand made comfort fit Wedding Band 5.0 mm wide. The ring has a beautiful hand made braid in the center. The whole ring has a polished finish. Different finishes may be selected or specified. 14 kt Hand Made Wedding Band - 14 kt two-tone hand made comfort fit Wedding Band 7.0 mm wide. The braid in the center is handcrafted and is a matte finish. The outer edges are polished. Different finishes may be selected or specified. Wedding Ring 14 kt Hand Made - 14 kt tri-color hand made comfort fit Wedding Band 9.0 mm wide. The center of the band has a handcrafted braid and handmade ropes on each side. The center has a brush finish and the edges are polished. Different finishes may be selected or specified. 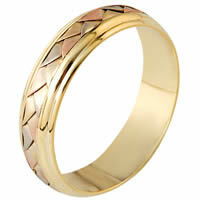 Wedding Band 14kt Gold Hand Made - 14kt two-tone hand made comfort fit Wedding Band 7.0 mm wide. The ring has a hand made pattern in the center and two hand made ropes inlayed in the band. The whole ring is polished. Different finishes may be selected or specified. 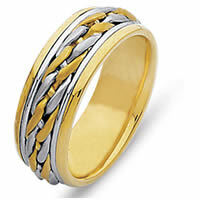 Wedding Ring 14 kt Hand Made - 14 kt two-tone hand made comfort fit Wedding Band 7.0 mm wide. The ring has a hand made polished braid in the center. The whole ring has a polish finish. Different finishes may be selected or specified.